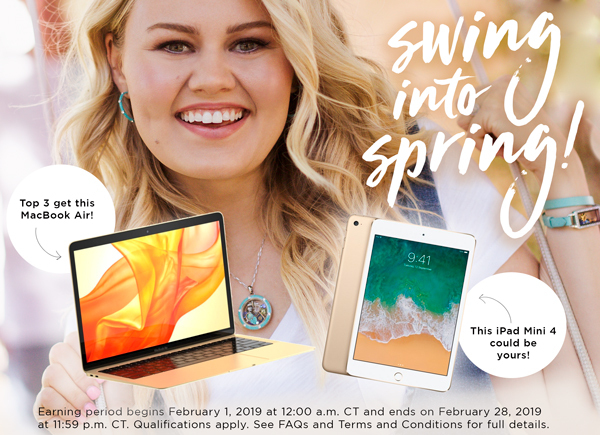 Are you ready to “Swing into Spring” and earn a coveted tool made by Apple for your O2 business? As we announced at the L.E.A.D. 2019 O2 Empowerment Summit, we’ll be offering a NEW! incentive every month through July 2019 to help you focus on your goals, grow your team and fire up your business! What: Earn an iPad Mini 4 – the sleek iPad Mini 4 is thinner and lighter than ever before and sets you up for success in your O2 business while you’re on the go! And…it gets even better! The Top 3 Earners* who sponsor the most new Designers (who generate at least 250 PV each) will earn a MacBook Air valued at over $1,000! *Please note, if there is a tie for Top 3, the earners will be determined by the Designers with the highest Personal Volume. All Designers: Tune in to the O2 Designers News from the Nest Facebook group every Monday to hear Field Trainer Abby Teet’s Monday Mindset where she’ll share her tips for success during this limited-time incentive. Team Leaders and Above: Tune in to the O2 Leadership Community Facebook group every Wednesday to hear Director of Leadership Development Renee Rose’s Leadership Lunch & Learn where she’ll share her tips and ideas to grow your team during this limited-time incentive. Read the FAQs for all the details. Are you ready to grow your team and be unstoppable in 2019? Get your game plan set and let’s go!